Should you oversize your solar array / undersize your inverter? After numerous questions about the relationship between solar panel power and inverter power, I decided to put together this blog post. Now logically, if you have (say) 3,000 Watts of solar panels on your roof, you would expect that a 3000 Watt inverter would be the perfect match, right? There are a number of issues to consider which might determine the ideal inverter size. I’ll take you through them. The first and most important issue to remember is the rating of our 3,000 Watt solar panels is a peak, or instantaneous rating. Solar panels produce different amounts of power depending on their orientation and angle towards the sun, temperature, the density of the air and so on. So, for consistency they are all produced, tested and rated under “Standard Test Conditions” which happens to be 25 degrees C, 1000W m2 of sunlight and an Air Mass Density of 1.5. This is similar to a 100HP engine rating for example. A 100HP engine will only actually produce 100HP under a certain set of circumstances (temperature, tuning, fuel type, throttle position etc). Any change to these conditions or wear and tear and your engine won’t produce 100HP and it’s the same for solar panels. Secondly, the peak available sunshine actually occurs for a very short period of time during the day (around 1-2hrs) and either side of that time of course, the output is less. So, when you take into account seasonal and weather variations, non optimal conditions, efficiency losses, DC to AC losses and the natural degradation of components, you are extremely unlikely to ever see 3,000 Watts from your 3,000 Watt solar system. A rough rule of thumb I use (after two decades of looking at data) is that you will typically see around 80% of the peak output rating as a real peak power – so around 2,400 Watts.The Alternative Technology Association has a story about this here. “But that’s a rip off !” I hear you say. Well, if it’s sold honestly and clearly, it’s not because this is disclosed. More importantly, solar design is more about daily energy than instantaneous energy and we have great standards and design rules for calculating energy output from solar systems which take this into account. 2 – To Upsize or Downsize? Occasionally you will see solar systems that have oversized inverters, for example a 3,000 Watt solar array with a 5,000 Watt inverter. This is sold as a feature to allow the upgrading of your solar array in the future. It’s a reasonable approach assuming that you can find the panels to match in a few years, the engineering is done right to avoid losses and you don’t mind spending money on something that you may or may not use in the future. Quite often you will also see undersized inverters, for example a 3,000 Watt solar array with a 2,400 Watt inverter. This is sold as a feature (sometimes referred to as overclocking) to fully maximise the inverter capacity and save on costs and is also a reasonable approach. However the engineering and design needs to be spot on or you can damage the inverter. the Clean Energy Council design rules specifically take this into account and allows overclocking of up to 30% within its guidelines. So, you can quite reasonably upsize and downsize, within the rules, depending on what you are trying to achieve but importantly, the inverter needs to be able to handle it. To a case in point, we quite regularly sell systems that are downsized (on the inverter) for cost and performance maximisation and where we have components that are ideally matched. For example, a 315 Watt (DC) LG Neon solar panel matched to an Enphase 250 Watt (AC) inverter. This is oversized by 21% so well within the rules and as described above, it actually makes outstanding use of the capacity and avoids any wastage. 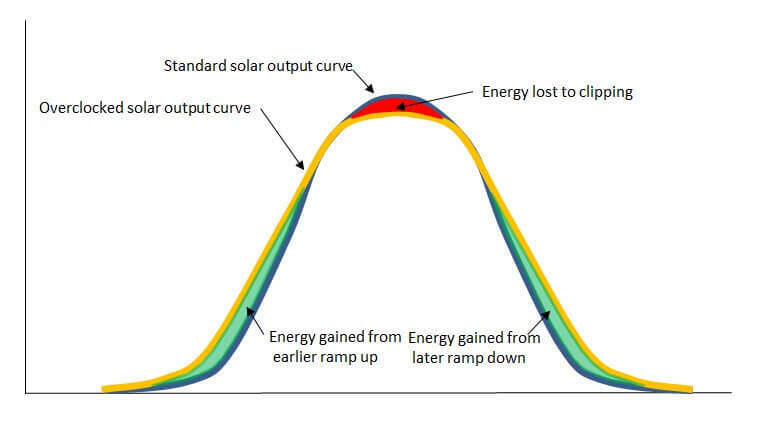 However, in perfect solar conditions for small periods of time this can lead to “clipping” where (for example) the panel wants to produce more energy but is limited by the inverter. Several customers have asked about the amount and value of lost energy due to clipping in overclocked systems like this and there are two versions of the simple answer. Firstly, although you may lose some energy when and if you clip, it will be for a short duration. As the great guys from AC Solar Warehouse wrote in a paper on the topic recently,the value of that energy (assuming it was offsetting at 30c kWh is about “29.6c per solar panel per year”, or $2.96 per year on a 10 panel system. So, what you may lose at the peak, you will gain on the fringes and in inclement or overcast weather you can potentially gain even more because the peaks solar outputs are lower. All up, the summary comes down to this – overclocking, when done intelligently and with the right equipment will in all likelihood increase or at worst equal the energy from a system that is not overclocked. Nigel is one of the foremost solar energy analysts in Australia, having worked in the industry for over two decades. A factor that I have not seen mentioned in the discussions on “overclocking” is the limit the energy companies put on the size of your inverter. My supplier (Origin) now puts a 5kw limit on the inverter for single phase supplies. This adds an additional incentive to overclock. The discussions also don’t seem to talk much about winter and cloudy days, when the output from the solar panels may be substantially reduced. I have had a 3kw system for 6 years, which I now want to upgrade, and I would happily overclock my proposed new 5kw system with 10kw of panels if I could. However, I appreciate the heat and inverter life issue and I read there is some regulatory limit to 30% overclocking. What we need is some type of switch that automatically disconnects sets of panels from the inverer when the total panel input becomes too high. That’s certainly a good point, which we will keep in mind for future updates of this article as well as others. By the way, the limit is not likely to be set by your ‘supplier’ (in this case, Origin – who are a retailer), but rather the local network. We’ve just published an article on the topic here. My question is, firstly the solar panels seem to be half what the inverter can handle? Not sure I’m correct about that? If that is the case, do the batteries have sufficient storage for the 1980w solar panels or the 4KW inverter? That’s a tricky, technical question for us to answer, as the installer/system designer might be looking at the batteries as part of what’s going to be fed into the inverter/charger during times of peak demand. Is it an off-grid system? I DON’t believe in most cases over sizing the inverter is the best option, due to the cost of going up in size of the string inverter is so cheap. An example is an SMA sunnyboy, the next size up is about $100 for an extra kw. If you make an extra 2 kw a day from not “clipping” the lost kw produced, and you’re paying 10 cents a kw, that’s $6 a month, or 16 months is the break even. As you know I’ve been involved in the manufacturing of many thousands of inverters for over 25 years. While your points are vary true, what we see as inverters age and eventually fail, one of the main causes of short life is heat. By installing the inverter in hot areas without proper airflow and/or over driving the inverter with extra solar modules, lnverter life is usually compromised. These days with low inverter prices spending just a little bit more on slightly larger inverter and having it run much cooler in our experience it will last much longer and may even run more efficiently.